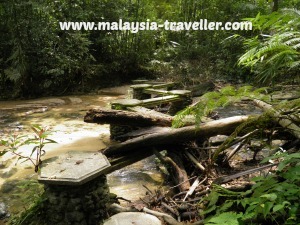 Take this hike to the waterfall at Templer Park if you want to get an authentic jungle experience within easy reach of Kuala Lumpur. I returned there recently. See this short video slide show to get an idea of what to expect. 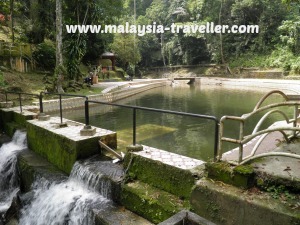 The park, known in Bahasa as Taman Rimba Templer, is located north of Batu Caves, about 20km from central Kuala Lumpur. 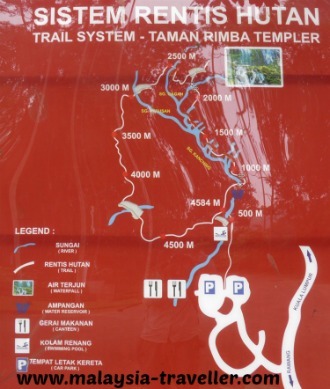 The entrance to the park is accessed via a turn-off on the right side of Highway 1 (when travelling north), before you reach Templer Park Country Club. 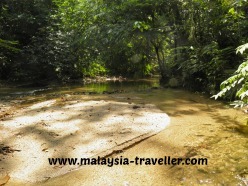 It is part of the same stretch of rainforest which includes nearby Kanching Waterfalls and Commonwealth Forest Park. The turn off leads to the car park where there are toilets and a playground, together with a map showing the trail system. According to the map, the waterfall is about 2km away. It took me about 1 hour to reach the waterfall (2 hour round trip) and I came back by the same route, though it is possible to do a loop of 4.5km length. 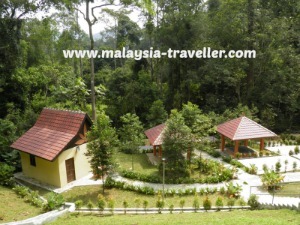 From the car park, the path passes a newly constructed area with gazebos, bbq pits, and camping site. After 500m you reach the ‘swimming pool’, filled naturally by river water which gives it a rather uninviting dirty green colour but is probably as clean as swimming in the river itself. Here the trail proper begins. 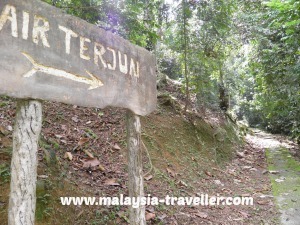 marked by a sign pointing to ‘Air Terjun’. 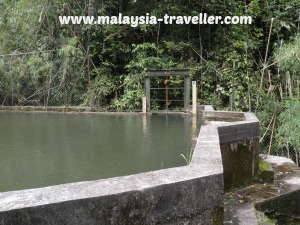 After another hundred metres or so, the trail passes a water catchment tank before continuing to the first river crossing. The ground was churned up in a number of places on this trail evidencing that wild boars had been digging for tasty roots and morsels. Fortunately I did not bump into any of these boars which can be dangerous. The river crossings on this trail are via attractive zigzag concrete bridges, which in the main have so far managed to survive raging river water damage. The river water was looking clean and clear on my trip. 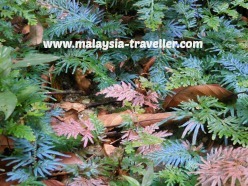 There is interesting fungus and colourful ferns to look at along the way. 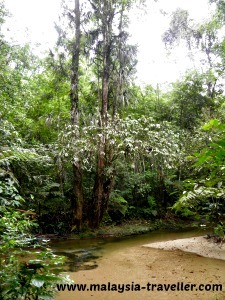 The trail more or less follows close to the river all the way to the waterfall, but in places it deviates and care should be taken to not to stray from the path. 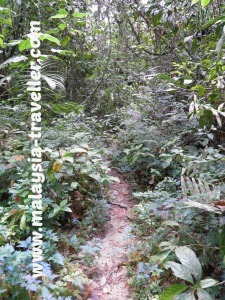 As the trail progresses it becomes narrower and less distinct with bushes and plants overhanging the path. These are ideal conditions for leeches and at the end of my hike I realised that I had been bitten on my shin, though the leech had already dropped off. 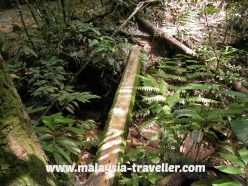 When you cross the third zigzag bridge you are close to the waterfall. 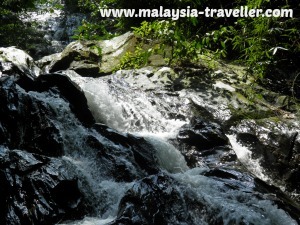 The waterfall itself, which descends in two cascades, is pleasant enough although the falls at nearby Kanching are higher and more spectacular. One father and son were camping at the waterfall but apart from them I only saw two other hikers even though it was a weekend. 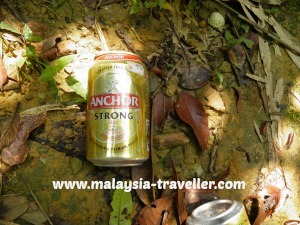 There was however quite a bit of rubbish at the falls which was disappointing. Inconsiderate hikers had done the hard work of lugging their food and drinks to the waterfall - how difficult is it to bring back the empties and waste? 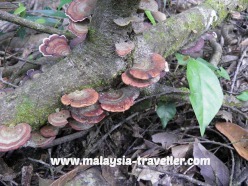 Unless you are camping, better to stick to daylight hours since wild boars and bugs are more active at night. 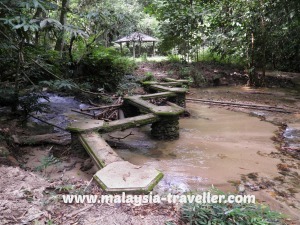 Considering this trail is so close to KL, it was mostly deserted and overgrown in places. It should not be underestimated and better not to go alone. The river and waterfall are clean and pleasant. It is an enjoyable walk.